EcoBac is a liquid bacteria formula that controls a wide array of bacterial and fungal plant pathogens. The microbes in EcoBac control the growth of pathogens by diverse mechanisms making this product reliable in diverse crops attacked by a wide array of plant pathogens. EcoBac can be applied to the soil with any type of irrigation systems. EcoBac can be applied to the foliage with any devise used for this type of application. 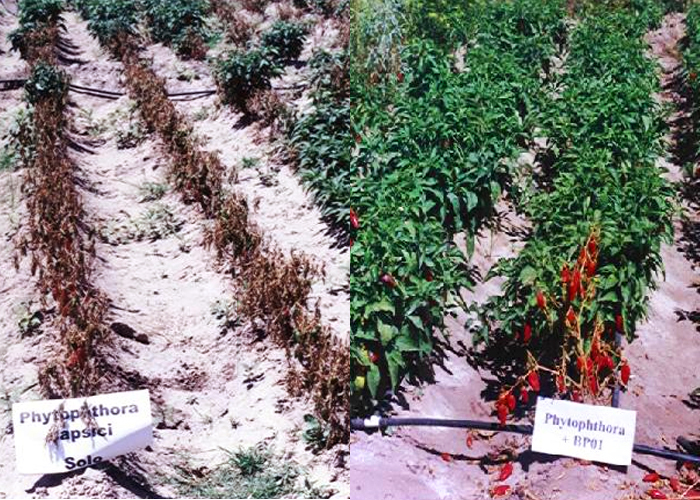 Rotation of soil and foliage applications brings control of soil and foliage pathogens. EcoBac cannot be sold in the USA until its biopesticide registration is completed. EcoMicrobials, LLC (“the Company”) was founded and incorporated in Florida in 2001. From inception, the Company has been engaged in the development, manufacture, and marketing of environmentally compatible products for the agriculture industry. 12 February. Conference presentation of products to growers in Fresno, California, sponsored by Sheming Gardens. 13-15 February. World Ag Expo in Tulare California. Commercial booth in association with our distributors Sheming Gardens.